…and it doesn’t appear that the state’s media has much interest in holding him accountable. We raise this subject because the status of Louisiana’s procurement of federal aid is in question at this point. The original number attached to damages Louisiana suffered as a result of the August flood was about $2.8 billion – but when Gov. 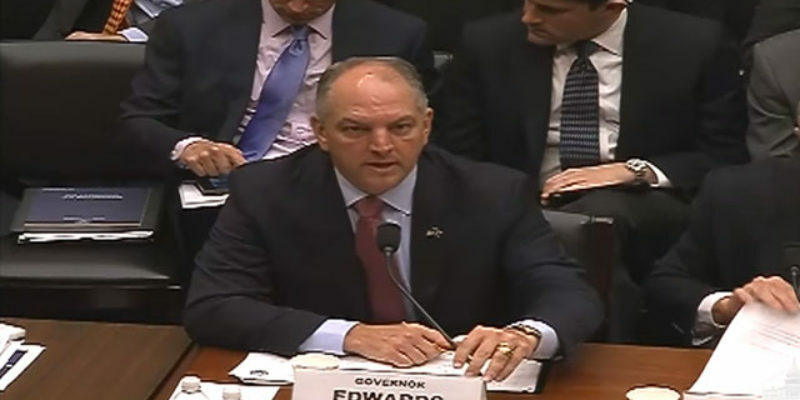 John Bel Edwards went to Congress to testify, what came out of his mouth was $2.1 billion. Now the number being talked about is $4 billion, only $437 million of which has been appropriated – as part of a deal at the end of September which avoided a government shutdown. We’re going to have a series of posts on this subject over the next few weeks, and a number of issues are going to be discussed. First, where is the state’s plan for flood recovery? Edwards might be asking for $4 billion, but there isn’t even a written plan for spending the $437 million he already has, and that money has not been tapped into at all. How is Edwards, and more specifically the state’s congressional delegation, which is not without power to move the needle on the appropriations process, going to secure a second batch of funding without showing a plan for spending the first batch, much less anything else? Six weeks after trekking to Washington to seek the first installment of recovery funds, one would have thought this administration would be far further along. Second, what movement is there on the Comite River Diversion Canal project? That’s the single greatest action anyone could take to restore faith that houses rehabilitated following the August flood won’t go under water again, and it’s a long-overdue public works project which hasn’t been built because, supposedly, there is no money to build it. Well, you now have $437 million in the bank and the price tag for CRDC is just over $200 million. There isn’t much talk about building it in recent days, and instead you’re hearing that tens of thousands of homes which may not have been flooded were it already in place are now required to be elevated, at a cost of $40,000-70,000 apiece on average. Baton Rouge’s congressman Garret Graves has been loudly advocating for a rethinking of the demand for home elevation before building permits are given. He’s saying it’s significantly cheaper to do flood protection – the diversion canal, levees ringing vulnerable neighborhoods – than to force everyone to raise their home. And he’s probably right – not to mention the fact that if you raise your home four feet and you survive three feet of water that way, you’ve still lost your car, your outside AC unit has still been flooded, you’re likely still out of power and you likely are still marooned without potable water for as long as the floodwaters are in place. Wouldn’t it be better if your neighborhood just didn’t flood because it was protected by a levee that cost less than the 50 grand per house FEMA now demands be spent? And where is the governor’s office on this? There is the question of Louisiana’s flood recovery dollars being tied to federal money to bail out the Flint, Michigan water supply, and troubling questions about John Bel Edwards’ role in those negotiations. We know that he met with Harry Reid in mid-September when he went to Washington to make the case for flood recovery dollars, and shortly following that meeting Reid began making demands that Flint get a bailout for its municipal water system as a condition for South Louisiana flood recovery dollars – a demand that brought the federal government very near to a shutdown at the end of September. The two are considerably divergent in nature, and while it is well established that federal dollars be used for disaster recovery in the case of an act of God like a flood, it is anything but established practice that federal money be used to remedy man-made disasters at the local level. Every bit of municipal infrastructure in the country is now on the table for federal dollars in the negotiations over normal spending thanks to the Flint demand, which augurs deficits currently unimaginable, and if Edwards allowed himself and Louisiana’s flood victims to be made pawns in establishing that terrible precedent…wow. And there are considerable questions about Edwards’ Shelter At Home program, in which Louisiana drew almost a billion dollars from FEMA in order to pay contractors – not homeowners, contractors – to supply flooded houses with a few basic installations like kitchen and bathroom sinks, a shower, working electrical outlets and the like. We’ve heard rather widespread reports that the quality of work and materials this program paid for was often extremely poor, and that the $15,000 per home spent on the program was very largely wasted. This brings into question why Shelter At Home was designed in the way it was – was the program set up according to tight parameters established by FEMA, or were those parameters loose enough to allow for the state to come up with something better and it simply chose not to? Moreover, there is the question of duplication of benefits, which is a major concern of the federal government when it provides outlays for disaster recovery. FEMA does not like to pay for the same thing twice. Has Edwards’ administration started the ticking on a time bomb with Shelter At Home in this regard? Which is to say, do recipients of Shelter At Home close off the possibility of further FEMA aid? If so, then the “temporary” quality of the Shelter At Home installations becomes a significant issue; if the bottom-quality sink you were issued for your bathroom isn’t something you’d have as a permanent fixture in your home, and you weren’t allowed a choice in the bathroom sink the program installed there, are Louisiana and FEMA now going to tell you you’re out of luck with help to replace it? Or, much more frightening, if there is no such prohibition and then FEMA “opens the books” in a couple of years to review aid given to the state and decides that Shelter At Home aid combines with further FEMA grants to amount to duplication of benefits, FEMA will then demand reimbursement from the state. And if the state then goes back to the homeowner seeking to be made whole at the inflated government rate paid to the contractor, and the homeowner objects that the materials installed were ripped out and replaced when the home was restored, you will have one tragic mess on your hands. These issues, and more, will need to be examined. There has been little examination of them in the 2 1/2 months since the flood began. The clock is ticking for tens of thousands of South Louisiana flood victims who remain in limbo for some idea of how flood recovery is to proceed, and there is little evidence – and much resulting consternation, particularly among Louisiana’s congressional delegation – that our governor knows what he’s doing.